Hi, Does anyone know how can I solve this? I can't see the full error message because the alert box is too small. 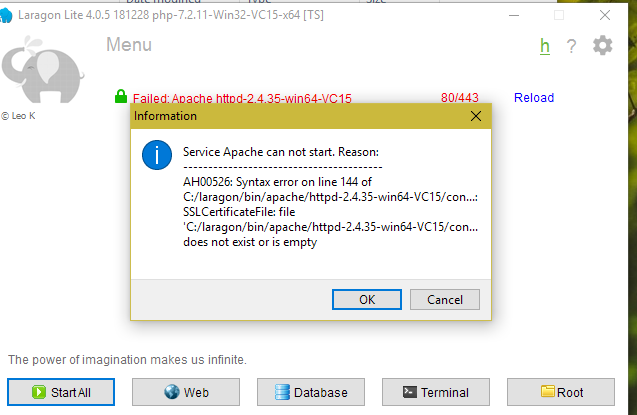 I've enabled the SSL but can't start the apache server. I'm using the latest release of laragon. I just checked the logs and I saw this. 2019] [mpm_winnt:notice] [pid 14288:tid 532] AH00354: Child: Starting 64 worker threads. [Wed Jan 02 12:04:48.139447 2019] [mpm_winnt:notice] [pid 7188:tid 448] AH00424: Parent: Received restart signal -- Restarting the server. [Wed Jan 02 12:04:50.141080 2019] [mpm_winnt:notice] [pid 14288:tid 532] AH00364: Child: All worker threads have exited.